Were the original authors of Scripture supposed to write their books in pencil? In other words, are there errors in the Bible that need to be corrected? Scripture never affirms anything that is false. If you are like me, you don’t believe in the inerrancy of Scripture because you have worked through every alleged discrepancy in the entire Bible and found a satisfying answer for each one. So why should a Christian believe that Scripture is inerrant? Here we have Paul claiming that all of Scripture is God-breathed, or inspired by God. Now it could be argued that this reference is only speaking about the Old Testament since the New Testament wasn’t completed yet. At least four passages, however, imply that the New Testament is also the Word of God. “The Spirit of truth, who proceeds from the Father, he will bear witness about me. And you also will bear witness, because you have been with me from the beginning” (John 15:26-27). Jesus affirms that the future teaching of the apostles (which would later be written down in the New Testament) comes directly from God. “And we also thank God constantly for this, that when you received the word of God, which you heard from us, you accepted it not as the word of men but as what it really is, the word of God, which is at work in you believers” (1 Thess. 2:13). Third, Paul quotes the Gospel of Luke as “Scripture” (1 Tim. 5:18; Luke 10:7). Fourth, Peter calls the writings of Paul “Scripture” (2 Peter 3:15-16). So far we see that the Bible claims to be the Word of God. And since God cannot err, the Bible cannot either. 1. “But it is easier for heaven and earth to pass away than for one dot of the Law to become void” (Luke 16:17). The Scriptures are so sure and eternal that it is more probable for heaven and earth to vanish than the smallest part of the law to fail. 2. “Scripture cannot be broken” (John 10:35). Here Jesus affirms that Scripture is binding and indestructible. 3. “Everything written about me in the Law of Moses and the Prophets and the Psalms must be fulfilled” (Luke 24:44). In Jesus’ mind, the prophecies in the Old Testament must come true because Scripture can never be wrong. 4. “Your Word is truth” (John 17:17b). If God’s Word is truth, then surely none of it can be false. In summary, I believe that the Bible is inerrant for two reasons. First, God always tells the truth and the Bible is God’s Word. Second, Jesus believed that Scripture is unbreakable and trustworthy in all that it affirms. Thanks for the comment! Well actually I was saying that although I believe in inerrancy, I didn’t come to believe in it by working through every difficulty in the Bible. 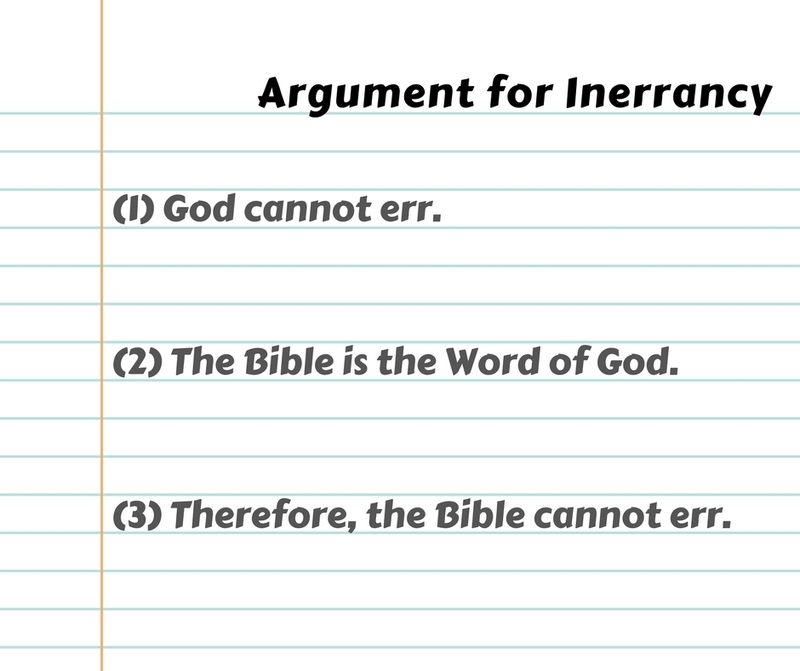 And then I go about presenting two arguments on why Christians should believe in inerrancy even if they never worked through every possible discrepancy. So I affirm inerrancy but for those two reasons. But I may consider changing the wording if it confuses future readers. Thanks! Previous Previous post: A Funeral is Better Than a Party?